I remember the first time I had to pack a china cabinet full of stemware. Wine glasses. Champagne flutes. Crystal crafted and etched so delicately it might as well have come straight out of a fairytale castle. My hands shook as I wrapped each piece. My stomach churned as I watched my buddy load that dish pack onto the truck, underneath a stack of other boxes. 20 years later I still have nightmares about it. I’ve dealt with plenty of stemware since then, and while I wonder now and again whether anything I’ve packed has gotten damaged in transit, I’ve learned enough from people who have been around longer than me to know how to minimize the chances. Below is a summary of what those people taught me. While dividers can add stability to the carton and protection to the contents, the fundamentals of packing still apply. Make it tight. Density still matters, even inside those cells. 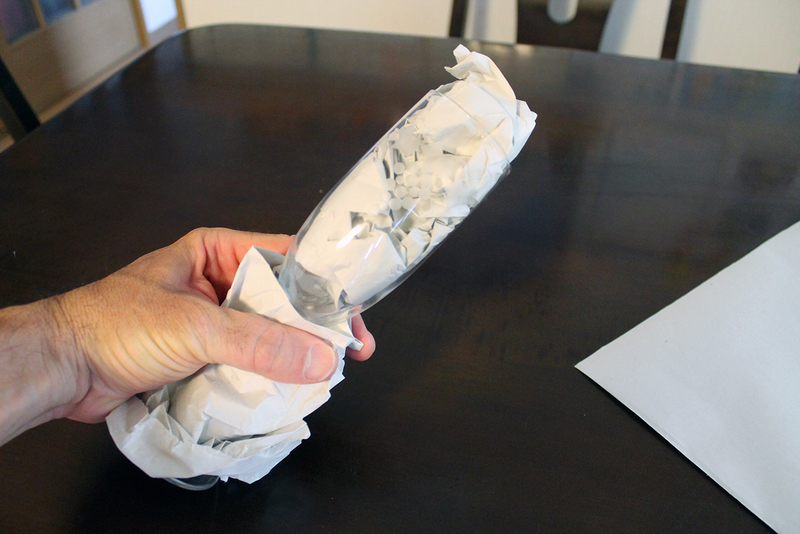 Create cushions of packing paper between layers. Be generous when padding the bottom and the top of your dish pack. In addition, there are things that require extra attention. This goes a long way in keeping those crumpled up paper balls in place under the weight of all that kitchenware. This will also prevent your dividers from sinking and potentially exposing the stemware those dividers are supposed to be protecting. Be aware that dividers aren’t always the perfect height for the stemware you are packing. If your wine glasses are a bit short, add extra paper beneath and on top to fill out the space in each cell. Are those champagne flutes too tall? Don’t leave them sticking out of the top! Make a double layer of dividers, pad those glasses above and below, and, to use that extra space wisely, fill the remaining space in each cell with smaller glasses (that are also well-protected). No one in the history of packing has ever had the exact amount of stemware needed to perfectly fill the number of cells in the dividers they are using. Since the customer has requested you use those dividers for all, not most, of their stemware, don’t skimp or cheat at the end and pack those last few crystal wine glasses loose among the coffee mugs and tea cups. Fill that last divider level with those remaining pieces of stemware plus whatever other items will fit in those cells. And if you find you have more dividers than you need? Use the leftover pieces to create a sort of cardboard roof over your top divider level so you can pack and fill the remaining space in your dish pack with confidence. This was the case that first time I had to pack stemware. And while it is absolutely possible to pack a bunch of fine, fragile wine glasses safely without dividers, it takes a lot of care – and plenty of paper! The biggest concern in wrapping stemware is that most fragile part: the stem. The thing is, all the paper in the world won’t guarantee the survival of that stem if the pressure is too great. Still, that’s the first part we want to protect. The longer the stem, the more critical it becomes to wrap that stem in paper. We do this mainly to create a more cylindrical item we can then wrap completely. Cylindrical bundles allow for a tighter, denser pack. The more empty space there is around the stems of those wrapped glasses, the greater the chance those glasses will shift and generate uneven pressure inside the carton. I see and hear all the time how important it is to stuff the inside of your wine glasses with paper. To be honest, I don’t get it. If there’s enough lateral (sideways) pressure being exerted on the outside of a glass to break it, crumpled paper cannot offer nearly enough strength to counter that pressure. What the paper CAN do is add a degree of protection against vertical pressure. As with packing glass lampshades, stuffing each glass with enough paper so that paper extends beyond the rim of the glasses means extra cushioning between layers. Speaking of layers, as we mentioned earlier, a stable layer of paper at the bottom of the carton is critical for the overall protection of the contents. When packing stemware without dividers, we want to make sure the cushioning on top of and below each layer of wrapped stemware is thick and stable. Lay some wrinkled paper across your layer, add a layer of crumpled paper balls, then cover with more flattened paper before packing your next layer of glasses. 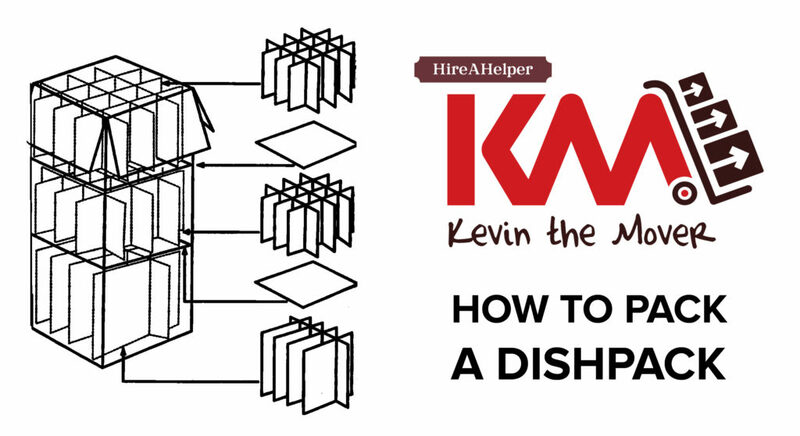 Without the strength of those vertical dividers we need to make sure our dish pack is jammed with paper not just between layers but between and around all those glasses – which we should be packing upside down, by the way! And of course, a dense, thick layer of paper on top is a must. One final point about packing stemware: the use (or not) of bubble wrap. 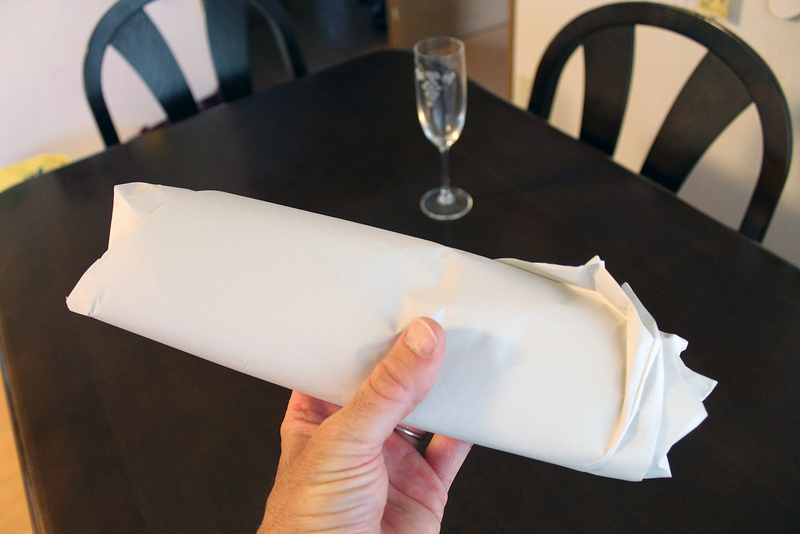 As with stuffing paper inside your wine glasses, I’ve seen plenty of tips involving wrapping stemware with bubble wrap. Personally I’ve never used it on any type of glassware. Ever. Nor have I ever done an unpack and seen it used. Does this mean you can’t use it? Of course not. It just might not be your most practical option. If you do use it, be aware that some people will strongly advise against wrapping a glass in plastic without wrapping it in paper first. One reason is the possibility of the plastic leaving marks that are hard to get rid of. Another is the tendency of plastic to stick to glass, increasing the likelihood of pressure and thus damage. In simple terms, use it at your own risk. To sum up, if you use dividers when packing stemware, make sure they are level in the carton and that the cells are filled tightly. And make sure those stems aren’t going to end up sticking out the top. If you aren’t using dividers, use common sense. That is, use plenty of paper! Make your carton super cushioned and super stable. And pack those stemware items upside down. 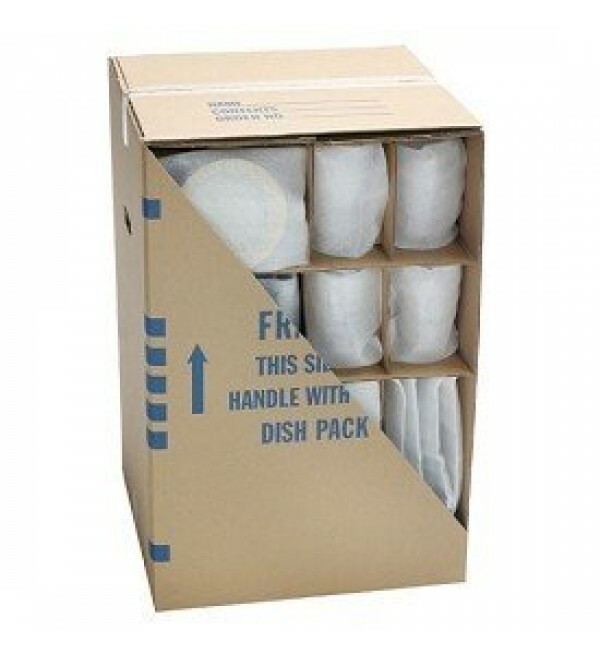 A well-packed dishpack starts at the bottom, with a layer of paper to cushion and protect those pounds of plates, dishes and bowls. 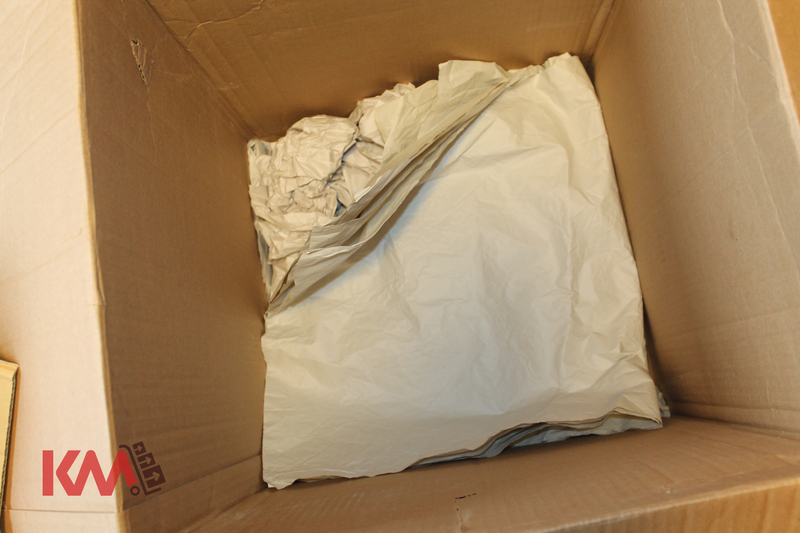 Some movers will fold a dozen or so sheets of packing paper to create their thick layer of padding. Others will ball up these dozens or more sheets of paper and create a sea of crumpled newsprint at the bottom of the box. I’d never been completely comfortable with either of these strategies. 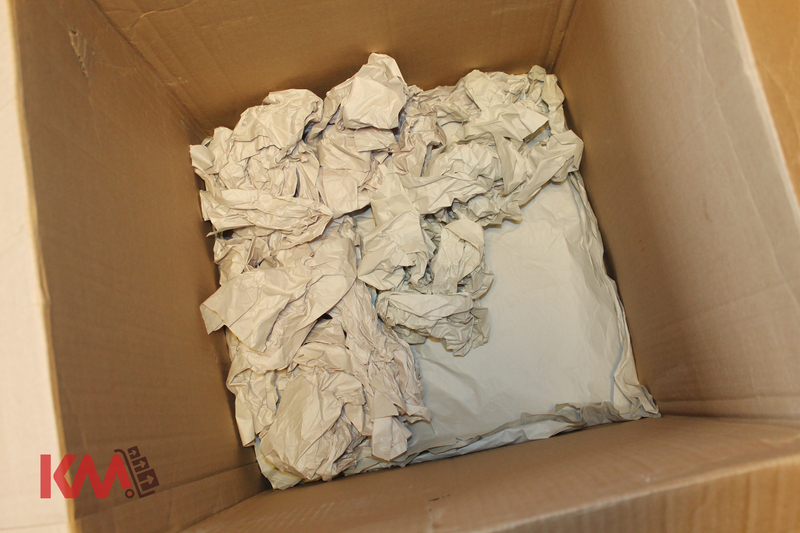 Folded packing paper, no matter how many sheets, never seemed cushiony enough to me. I always envision that sea of crumpled paper parting under the weight of all those dishes, which would then end up sinking to an unpadded box bottom. But what else was there to do? It had to be one or the other, right? So now I do both. Ever since that “Eureka” moment, I start my dishpacks by putting down a layer of several folded sheets of packing paper, adding a dense layer of crumpled paper, then topping that off with a layer of more folded sheets of paper. The crumpled paper layer in the middle gives plenty of cushioning, while the layers of folded paper help keep that middle layer in place. There’s more than one way to cushion a dishpack. This just happens to be my favorite because it provides the most amount of support, which in turn, has helped me keep claims down to a minimum.